Obituary: 68, Stephen Housefield, passed away August 28, 2013. Steve was born in 1945 in Indianapolis, was an Eagle Scout and Plainfield High School graduate. He received a BS Degree from Butler U and served in the U.S. Army Reserves. After 10 years at GM Steve opened and operated Wanderlust outdoor store in Carmel in 1976. He led many group backpacking, canoeing, cross-country skiing & hiking trips in No. America. He continued a lifelong love of the outdoors, wildlife and wilderness, which he shared with his son Chris, wife Karen and many friends. He enjoyed music, running, hiking, canoeing, whitewater paddling, and completed two Birkebeiner x-country ski marathons. An avid bird-watcher, Steve participated in many USGS & Audubon Bird Surveys & counts, and traveled the world. He retired from Contico International Inc. as VP of Sales in 2000. Steve hiked 850 miles of the Appalachian Trail at age 60. Throughout his life Steve was admired for his steadfastness, boundless energy, calm demeanor and endearing smile. Steve is survived by his wife of 26 years, Karen Bower; son, Christopher Housefield; brother John Housefield; mother Roberta Housefield, granddaughter Gabrielle Housefield and niece Lindsay Tatge. Graduated Butler University with a BS in Business,married 1966,son Chris born 1969. Worked for General Motors 10 years,then started retail business in Carmel,specializing in outdoor sports. Operated this business for 9 years, and simultaneously with a close friend, started Hoosier Wilderness Adventure,guiding,backpacking,canoeing and cross-country skiing trips throughout North America. Sold this business in 1987, at which time I also remarried. 1987-2000,Sales Manager,then VP of Sales for 3 Consumer Products companies,traveling Eastern US on weekly basis. Held most recent position for 9 years,and retired from that company in 2000. Consulted for small Indiana based company through fall 2001, then started up another small part time business in 2002. Have lived in Carmel home since 1979, and also maintain lake property in northern Wisconsin. Enjoy travel,birding,hiking,skiing,and am a livelong runner. My spouse,Karen, went to high school in New Albany and is an IU grad. 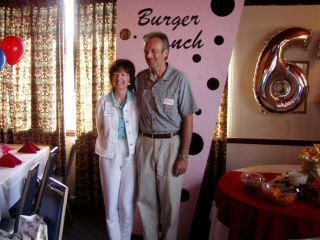 Steve with wife Karen at 40th reunion.